At the risk of sounding clichéd, I must reiterate that vast parts of Arunachal are still hard to reach and can give you a real sense of primal yet delightful wilderness that you are unlikely to find in most other parts of 21st century India. So, even the very act of reaching such places becomes an adventure in itself and that is where the real attraction of Namdapha lies. It takes an overnight train or bus journey from Guwahati to reach either Dibrugarh or Tinsukia, the nearest major cities to the Namdapha National Park. From there, cabs, buses, or shared vans can take you to a small place resembling a town called Miao in the Changlang District of Arunachal. It takes at least 5 to 6 hours to cover these 100 odd kilometers on gradually deteriorating roads. At Miao, you must get your papers checked at the forest office and take necessary permissions. After completing the formalities you can start moving towards Deban, where the Forest Rest House is located. However, it is more of a jungle trail rather than a road. So, the only vehicles that work here are certain pickup vans driven by locals of nearby villages. Overall, it may take anything between 18 to 20 hours to cover the 638 kms from Guwahati to Namdapha. Roads are good till Assam but deteriorates after that. The only purpose for describing this long and tedious journey is to explain what exactly to expect in Namdapha in particular and Arunachal in general. I visited Namdapha in the winter of 2013, with a couple of friends. Namdapha is also a designated tiger reserve but the thick forest makes it hard to spot the big animals. In terms of area, it is one of the largest national parks in India. 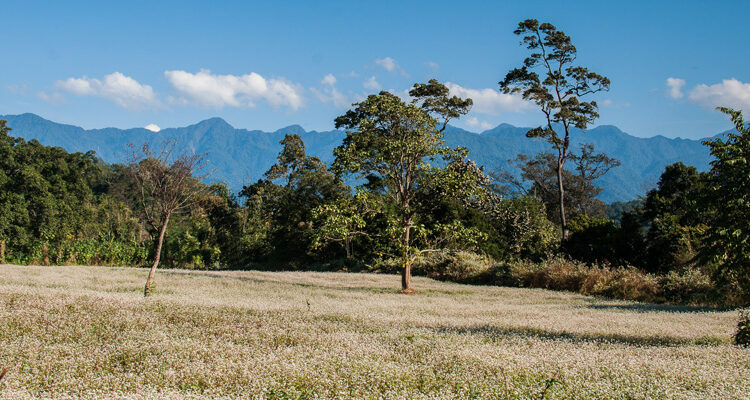 Also, unlike the deciduous grasslands of the plains in Assam, Namdapha is an evergreen rainforest that keeps getting denser as you move inwards. The elevation changes from 300 meters to 4500 meters at the highest point although the higher areas are not really accessible. Naturally, the flora and fauna also changes along with altitude, which explains the rich biodiversity of Namdapha. INITIALLY I JUST EXPECTED TO SEE SOME BIRDS AND ANIMALS BUT SOON I REALIZED THAT NAMDAPHA IS NOT YOUR AVERAGE NATIONAL PARK. There was no regular electricity supply inside the jungle and everyone seemed to depend on a generator and some solar panels for the dim lights at night. Considering the fact that it rains too much in this region, the solar panels did not seem to be very useful. Nevertheless, Noa-Dihing looks completely different in the morning as the golden light reflects on the transparent waters. Our guide for the day was a local guy (unfortunately I don’t remember his name properly) who seemed to have a keen interest on birds and carried an ornithology guidebook, along with a binocular and a machete. 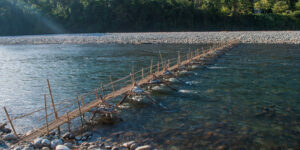 We initially walked by the side of the river bed, crossed a couple of bamboo and lumber bridges and eventually reached the jungle trail. The river seemed to keep changing colours and can look dark blue or muddy green at times, depending on the angle and the time of the day. There was a long seasonal bamboo bridge at one place, and a couple of fallen trees work as bridges at a couple of other points. Still, at one point we had to negotiate the forceful current of the river through waist-deep waters to reach the other side. During the rainy season even these small bridges can get washed away and that is why tourists are advised to visit between Octobers to March for a hassle-free experience. Seasonal bridge over the river. After the river crossing, the real jungle hike started. The jungle foliage was so thick that it was almost dark at places. We heard various sounds, that of birds and some primates but could not really locate anything. Initially we came across bamboo grooves but the trees got taller as we kept moving deeper into the jungle and eventually we entered the area where a thick canopy blocks the sun over the head and it gets dark even at noon. The weather was gloomy and then it began to rain but that was only expected in a place termed a “rainforest”. Strange fruit found in Namdapha. Nevertheless, the canopy cover was so thick that it saved us from getting wet. We kept walking through an immensely diverse collection of trees and plants and noticed strange fruits, and trees beyond our wildest imagination. We finally reached the camp called Hornbill Point although there was no hornbill to be seen. There is a small shed where forest guards, workers and tourists can halt for a while. We did spot a few Assamese macaques but they disappeared as quickly as they appeared. The trail also goes up further and as we were informed, we could have got some more exciting views if we could go further. But those interiors were closed due to a tiger survey at that point. The trek goes deep into the national park and for the best experience it is advisable to trek for at least a couple of days and camp within the jungle, although I could not do it myself. For this purpose, tents and ration will be needed to be carried along with the guide. Tourists generally come across various camping sites, namely Haldibari, Hornbill Point, Bulbulia, and Ranijheel through this trek but it all depends on the amount of days you are willing to spend trekking deep inside the jungle without any connectivity with the outer world. A hut at the end of the trek. After spending the whole day in the jungle, we came back from Hornbill Point, but not before having our packed lunch and some tea offered by the forest guards. At this point I must also mention Mr Gopal Chetri, the caretaker and cook of the Deban rest house, who cooked excellent food for us. As you can imagine, you can’t expect to find anything else inside the jungle. Before moving ahead, I must take some time off to discuss the incredible biodiversity of Namdapha. We got a glimpse of it and surely it will reward you with more if you spend more time inside. Apart from the tiger, the other big cats available here include the Indian leopard, Snow leopard, as well as Clouded leopard. Primates such as Assamese macaque, capped langur, stump-tailed macaque etc. can always be spotted here but one of the most exciting spotting can be that of the Hoolock Gibbon, the only ape available in the Indian subcontinent. Apart from this, some other exotic mammals at Namdapha include musk deer, hog deer, sambar, gaur, goral, slow lorris, giant flying squirrels, civet cat, red panda, Asiatic black bear among many more. Namdapha is also a paradise for bird watchers. Several varieties of hornbills, babblers, warblers, kingfishers, herons, falcons, etc are regular sightings here. According to an estimate, it is home to more than 400 known species of birds. However, the extreme interiors of the park at the higher altitudes still remain minimally explored and they can be hiding many more treasures just waiting to be discovered. Various rare species of butterflies and moths can also be spotted at Namdapha. The likes of Koh-i-noor, red caliph, naga treebrown, and East Himalayan purple emperor should keep the lepidopterists busy on a good day with clear weather. Botanists and tree lovers also have a lot to see and experience in Namdapha. The sheer variety of both recorded and unrecorded trees, plants, herbs and flowers can be mindboggling and it will take a lifetime to completely explore them. 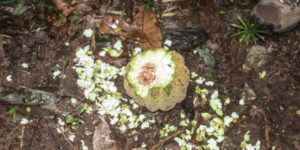 Especially, one noteworthy species here is the Sapria Himalayana, which has gigantic flowers and that is no surprise as it is related to Rafflesia, the largest flowers in the world! 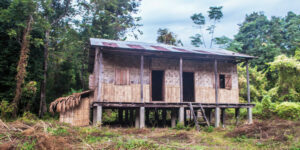 A house in the Chakma village. NAMDAPAHA IS NOT ONLY ABOUT THE JUNGLE, BUT IS ALSO A GREAT OPPORTUNITY TO GET ACQUAINTED WITH VARIED CULTURES OF THE REGION. 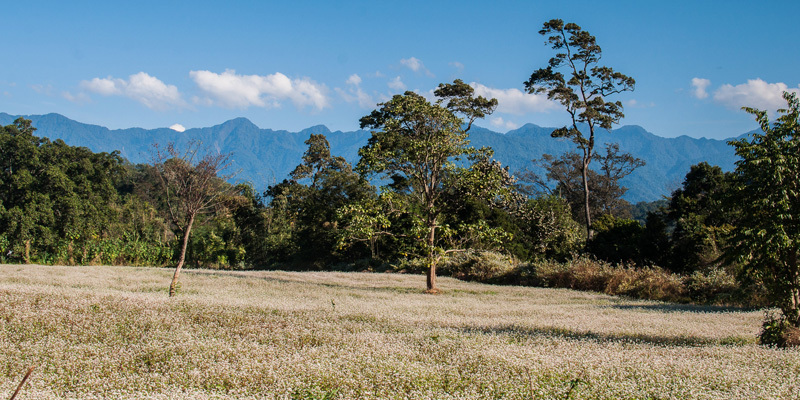 The areas around Namdapha are generally inhabited by Lisu, Chakma, and Singpho people, each having their own unique culture and language. The Lisus (also called Yobin), have their roots in the Yunnan province of China. 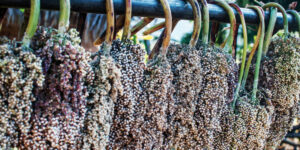 The Singphos on the other hand are the original tea planters of the region. Records have it that the Briitish explorers first tasted the Assam tea at the home of a Singpho chieftain. 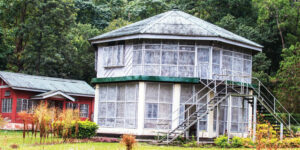 The Chakma village was located just near the rest house at Deban. So, we decided to walk through the surreal white fields of millets grown by them and then have a chat with the local women weaving their own colorful clothes. The Chakmas are going through turbulent times and have become refugees at some other parts of the world but here they seemed to be living a peaceful existence. These people mostly follow the religion of Buddhism. If you are looking for a more extreme adventure, you can think of reaching Vijaynagar, one of the remotest village in India surrounded by Myanmar from three sides. 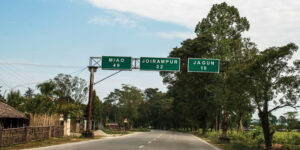 It still does not have any proper road connectivity but the ambitious Arunachal Frontier Highway Project has been proposed to connect the frontier areas of Arunachal from Mago to Thingbu to Vijaynagar. As of now, it takes several days to reach the village through the jungles although the armed forces flies helicopters sometimes. SO, JUST TO CONCLUDE, NAMDAPHA IS NOT A MERE JUNGLE SAFARI BUT AN EXPERIENCE FOR LIFE AT ITS MOST RUDIMENTARY FORM. Unlike other national parks, don’t expect jeep rides as it is just not possible in such terrains. It demands a certain amount of physical effort to explore but it rewards those who can undertake the same. The large mammals mentioned above can also be hard to spot considering the thick forests but the sheer density of the jungle transports you to an era before the dawn of the industrial civilization. 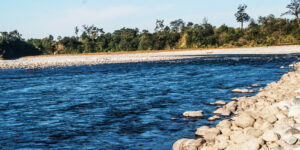 Tourists needs permits to enter Arunachal. The ILP can be collected at the respective offices in Delhi, Guwahati, or Dibrugarh. HOW TO REACH: You can first reach Guwahati and then either take a bus or a train from there to Tinsukia or Dibrugarh or then proceed to Miao by hiring a cab. From Miao, you can hire local vans to reach Deban. You can also take a direct flight to Dibrugarh to save time. Jitaditya Narzary sees himself as a travel blogger of the proletariat. 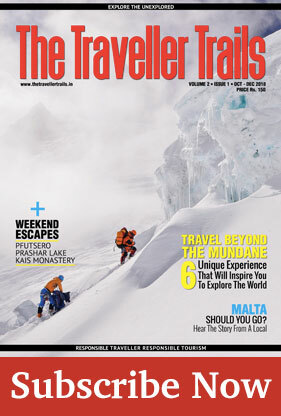 He is a budget traveller of offbeat destinations. He want to show that even people who did not top their exams and do not have high flying jobs can also break free from the tyranny of life at times and travel on small budgets. He never buy a travel package and avoid guides unless it is extremely necessary.